You may specify some global setting for R‑Studio on the Settings dialog box. You may reach it by selecting Settings on the Tools menu. If this box is selected, R‑Studio will automatically check for updates. If this check box is selected, R‑Studio displays an additional command Create FS Snapshot on the shortcut menu for an object with a file system. An FS Snapshot contains system data for the file system only (file descriptions without file contents). If a problem appears, this snapshot can be sent to R‑Studio technical support to identify the problem. This option greatly slows R‑Studio . 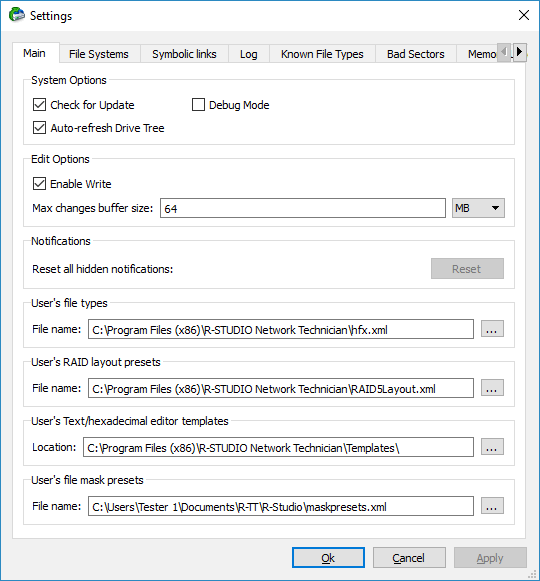 If this box is selected, R‑Studio automatically refreshes the list of connected disks. You may disable it if R‑Studio experiences problems with connected devices. If this check box is selected, R‑Studio enables you to write any changes made in the Text/​hexadecimal editor . Maximum amount of data stored for the Undo command in the Text/​hexadecimal editor . This button enables all previously disabled notification and warning messages. Specifies a file name and path to the file where the descriptions of user's known file types are stored. You need to re-start R‑Studio or click the Reload User's File Types button on the Known File Types tab for the new file to take effect. Specifies the path for pattern description files for Text/​hexadecimal editor . Specifies a file name and path to the file with file mask presets. 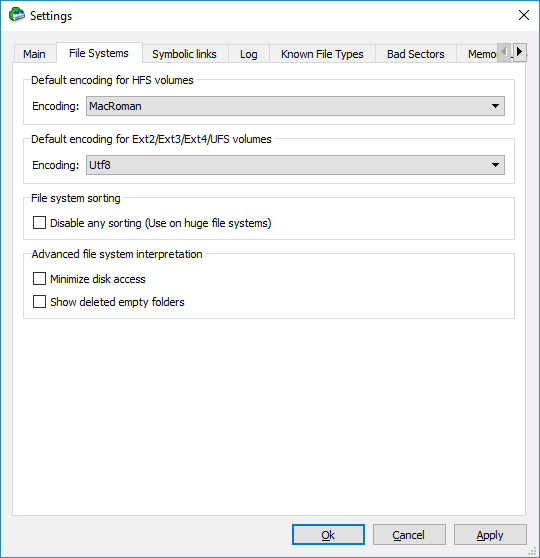 Select the national encoding for the HFS partitions. Select the national encoding for the Ext2, Ext3, Ext4, and UFS partitions. Select this option if the number of files on the disk is so large that R‑Studio sorts files in selected folders for too long time. Select this option if a lot of bad sectors are on the hard drive. R‑Studio will reduce access to internal files in the file system to speed up the interpretation of file system data. Select this option if you want to view empty deleted folders. Settings are available in the Technician version only! Symbolic links (of symlinks for short) are object that contains references to other files or folders directory in the form of absolute or relative paths and that affect pathname resolution. For example, if a symlink C:\ProgramData\Documents points to D:\Recovered Files\Root\Users\Public\Documents , entering it will result in entering D:\Recovered Files\Root\Users\Public\Documents . If both an object and its symlink are selected for recovery, both the object and its symlink will be recovered. The file path in that symlink will be converted from absolute to relative. Example: If the object C:\ProgramData\Documents is a symlink to C:\Users\Public\Documents , it will be converted to a symlink to ..\Users\Public\Documents . Therefore, the symlink will point to its object regardless of the place to which the object has been recovered. Only the selected object will be recovered. The selected symlink will be recovered as a real object. If both an object and its symlink are selected for recovery, both the object and its symlink will be recovered. The file path in that symlink will remain the same. The place to store recovered data: D:\Recovered Files . The recovered symlink: D:\Recovered Files\Root\ProgramData\Documents pointing to C:\Users\Public\Documents . Therefore, if someone tries to enter the symlink, the system will open the object C:\Users\Public\Documents , rather than recovered D:\Recovered Files\Root\Users\Public\Documents . Therefore, if someone tries to enter to the symlink, the system will open the object C:\Users\Public\Documents , rather than recovered D:\Recovered Files\Root\Users\Public\Documents . The symlink will be recovered as a symlink containing a path to a nonexistent object. If this check box is selected, R‑Studio writes its log into a log file specified in the File name field. 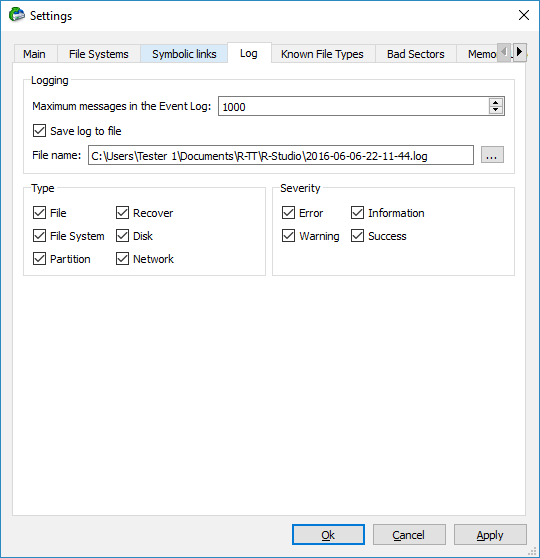 Specifies the file name in which the log will be saved. If this check box is selected, R‑Studio logs all events with recovered files. If this check box is selected, R‑Studio logs all events with the file system. If this check box selected, R‑Studio logs all events with partitions. If this check box is selected, R‑Studio logs all events with the recovering processes. If this check box is selected, R‑Studio logs all events with disks. If this check box is selected, R‑Studio logs all events with network operation. If this check box is selected, R‑Studio adds error messages into its log. If this check box is selected, R‑Studio adds warning messages into its log. If this check box is selected, R‑Studio adds information messages into its log. If this check box is selected, R‑Studio adds success messages into its log. NEVER WRITE A LOG FILE ON THE DISK FROM WHICH YOU RECOVER DATA!!! Or you may obtain unpredictable results and lose all your data. 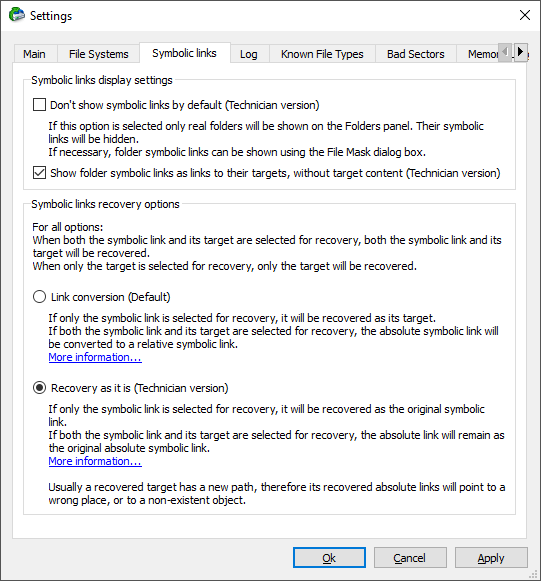 Note: If in the Recover dialog box the Condense successful restoration events check box is selected, the Log will display only Error , Warning , and Information event messages. You may specify which Known File Types will be enabled/​disabled by default. 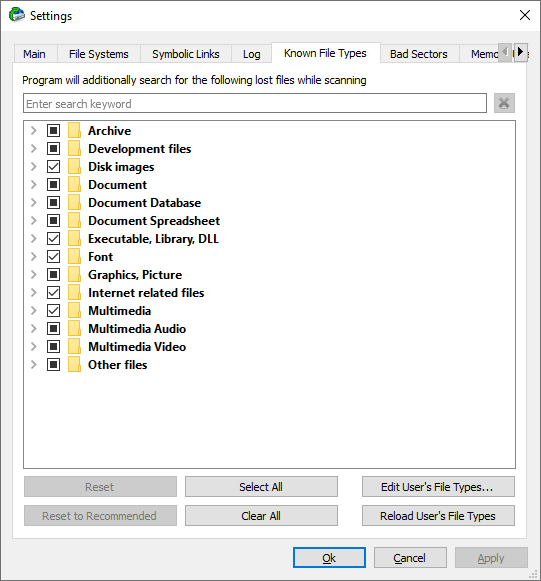 You may also specify know file types to search for during a specific scan session on the Scan dialog box. Click this button to reset the settings to the previous state. Active until the Apply button is clicked. Click this button to select all file types in the list. Click this button to clear all file types in the list except some predefined ones. Click this button to apply new file types after the user's file types file has been changes from the Main tab. Click this button to add a new customer's Known File Type, or to edit already existing ones. See the Customizing File Types help page for more details. Specifies a default value for I/O Tries , or how many times R‑Studio will try to read a bad sector. You may specify this parameter for each drive separately on the Properties tab. • If Default read attempts is set to 0, the entire part with bad sectors will be filled with the specified pattern. • If Default read attempts is set to a non-zero value, R‑Studio reads again that part sector by sector, repeating the attempts the specified number of times. If R‑Studio still cannot read a bad sector, it fills the sectors with the specified pattern. In this case only the bad sectors will be filled with the pattern, but that extremely slows the disk read process. For example, if you set Default read attempts to 1, a bad sector will be read 2 times. Click this button to reset I/O Tries for all drives to the default value. 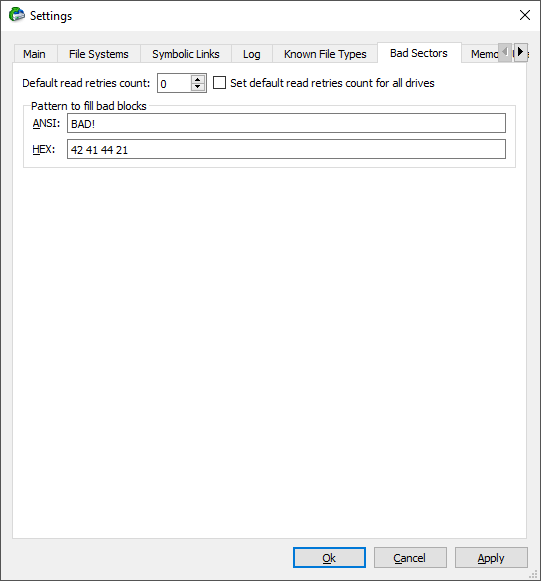 Specifies a default pattern R‑Studio will use to fill bad sectors in files to recover, in images, or when showing data in the Text/​hexadecimal editor . You may specify the pattern either in the ANSI or Hex data format. Note: R‑Studio will never ever try to write anything on the disk from which data is to recover or an image is to create. These settings control how much memory R‑Studio uses for its work. They help preventing R‑Studio from locking when trying to perform very memory-consuming tasks like scanning large disks or processing file systems with a lot of files. If this option is selected, the memory control is disabled. 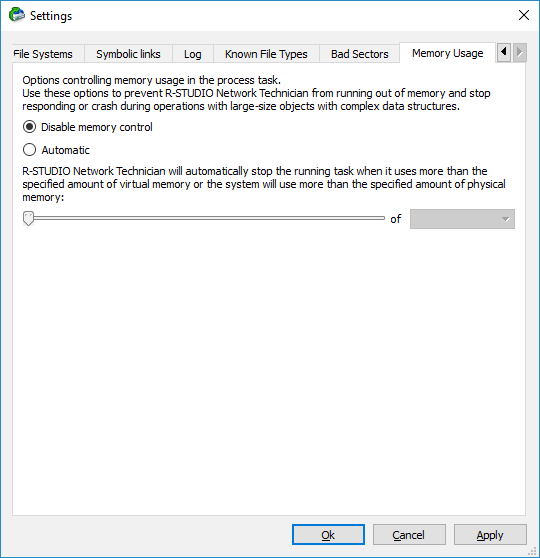 If this option is selected, R‑Studio will automatically stop performing the task when the amount of used memory reaches the specified value. You may specify the limit for either the virtual or physical memory. You may see how much memory R‑Studio actually uses on the Memory Usage dialog box.